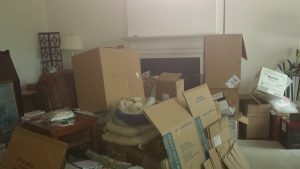 Like many people my age I find myself in the position of having to downsize my possessions. In my case it is complicated by being a collector. From a very early age I have collected “stuff”. As a child it was toys, comic books and animal figurines. As an adult it is figurines, art work, books, cook wear, craft supplies and a lot more items. I also have the inability to say “no” when offered an interesting piece of furniture, consequently I find myself with some pieces of furniture of which I need to divest myself. For many of us our “stuff” helps identify “who we are” making it even harder to give away. It is a bit like disposing of a piece or ourselves or our family. I find myself having to weed out my books which are a huge part of my identity. I have books on foreign countries, animals, memoirs, biographies, politics, paleontology, fiction and non-fiction, research and novels, humorous and serious, and religious and secular. I even have autographed books! Books tell my interests, my passions, and my life style. Each book I get rid of is like getting rid of a small piece of me. Other items are even harder. 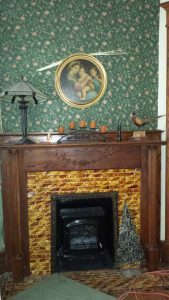 Family photos, heirlooms, antique furniture, art work. Most pieces come with memories that make it hard to leave behind. The part that makes it even worse is when you offer family pieces to someone in the family and they turn you down because they either don’t value it like you do or they do not have any space for it either! Then what do you do? Take it to auction, call the VOA or Goodwill stores? And what about the raw materials needed to hand craft items? Every time I take up a new hobby I find myself overcome with enthusiasm and purchase everything needed to create anything and everything possible with my new found passion. I tried basket making and bought all types and sizes of reed; I took up weaving and bought a lap and all types of yarn to weave; I tried making cheese and bought books and thermometers and rennet; I made copper enamel jewelry which required a kiln, enamels, copper blanks, jewelry findings; I sewed and still have material, a sewing machine, thread, zippers, lace, elastics, appliques and buttons; and there was macramé with its collection of twine, jute, beads, brass rings and pattern books…..Do I dare list the stenciling, stamping, beadwork, wood carving, wood burning, painting, drawing, and tie dying? I was fully prepared to tackle every craft or hobby to the fullest extent of my talents and wallet! 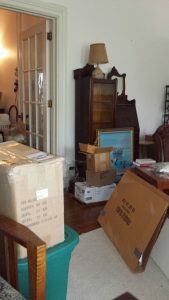 Then there are the items I took to make someone happy… figurine collections, plate collections, china sets, crystal, paperweights, marbles, Jell-O molds, crocks, blue glass canning jars, and cookie jars. I have had to close my eyes, stuff my guilt in my back pocket and let those things go. What about gifts from friends now deceased? Each of those has a memory, but is there any space for these things? I sadly decide to part with the larger items and keep smaller keepsakes if I can find space. I guess I will keep my friends in my heart and not on shelves. 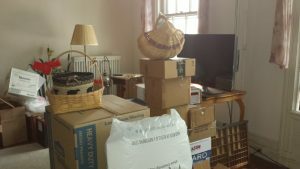 New house, new start, less things to dust around…it all sounds so appealing, but arriving at the point where it all comes together is harder than a person would think. I have a sister who is working at becoming a minimalist. I envy her the fortitude it takes to reach that point where it is comfortable to throw things out and not give them another thought. I have not arrived at that stage in the process, but I am working toward it every day.